The Montreal Alouettes (French: Les Alouettes de Montréal, IPA: [alwɛt]) are a Canadian football team based in Montreal, Quebec. Founded in 1946, the team has folded and been revived twice. The Alouettes compete in the East Division of the Canadian Football League (CFL) and last won the Grey Cup championship in 2010. Their home field is Percival Molson Memorial Stadium for the regular season and as of 2014 also home of their playoff games. The current Alouettes franchise was established in 1996 by the owners of the Baltimore Stallions. The Stallions were disbanded at the same time as the Alouettes' re-establishment after having been CFL's most successful of the American expansion franchises, culminating in a Grey Cup championship in 1995. Many players from the Stallions' 1995 roster signed with the Alouettes and formed the core of the team's 1996 roster. The latest incarnation of the Alouettes have proven dynamic on the field and were arguably the best CFL team of the 2000s; they took home three Grey Cups in that decade bringing the total for all incarnations of the franchise to seven. The Alouettes had from 1996 to 2014 the CFL's longest active playoff streak, having missed the playoffs twice since returning to the league. The streak came to an end in 2015. They have hosted a playoff game every year except 2001, 2007, 2013, 2015 and 2016 and have never finished with fewer than six wins. Their only four losing seasons came in 2007, 2013 and 2015 and 2016. 2015 and 2016 marked the first time the team missed the playoffs in consecutive years since their re-activation. Major stars of the recent era include Mike Pringle, the CFL career leader in rushing yards, and quarterback Anthony Calvillo, who leads all of pro football in career passing yards. Founded: The original Montreal club was founded on April 8, 1872. The original club was renamed as the Montreal Alouettes (skylarks or larks in English translation) in 1946. However, the original Alouettes club ceased operations following the 1981 season and was replaced by a new team, the Montreal Concordes, which played from 1982 to 1985. The Concordes were rechristened the "new" Alouettes for the 1986 season, but ceased operations the day before the 1987 season was due to start. The current Montreal Alouettes franchise commenced play in 1996. 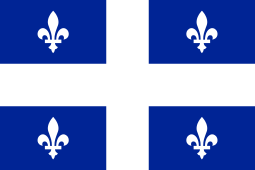 Although the 1996 Alouettes were technically an expansion franchise, they were initially owned by the owners of defunct Baltimore Stallions franchise that played the 1994 and 1995 seasons and acquired much of the Stallions' 1995 roster. Helmet Design: Silver background with a blue "A" and a charging skylark (alouette) holding a football. Home Stadium: The Alouettes play at Percival Molson Memorial Stadium for the regular season, while they play at Olympic Stadium for playoff games. Canadian football has a long history in Montreal, dating to the 1850s. The Alouettes were first formed in 1946 by CFL hall of famer Lew Hayman along with businessmen Eric Cradock and Léo Dandurand. They named themselves after "Alouette", a work song about plucking the feathers from a skylark, which had become a symbol of the Québécois. (Similarly, during the Second World War the RCAF's No. 425 (French Canadian) (Bomber) Squadron assumed the skylark as its badge and the motto "Je te plumerai"—"I shall pluck you".) They won their first Grey Cup championship in 1949, beating Calgary 28–15 led by quarterback Frank Filchock and running back Virgil Wagner. The team was purchased in 1954 by Ted Workman – and while the team continued to enjoy success, that all changed at the end of the 1960 season. To be more specific, the team was shaken by an announcement on November 10 – namely the trade of Hal Patterson and Sam Etcheverry to the Hamilton Tiger-Cats for Bernie Faloney and Dan Paquette. Workman had concluded the deal without consulting with general manager Perry Moss. The deal quickly fell apart because Etcheverry had just signed a new contract with a no-trade clause; as a result, Etcheverry was now a free agent. The deal was reworked and Patterson was traded for Paquette. 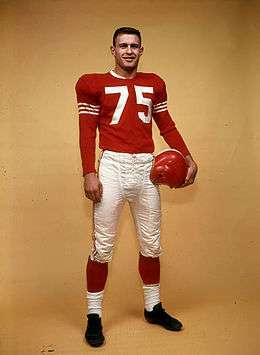 Sam Etcheverry went on to play in the NFL with the St. Louis Cardinals for 2 years (1961 and 1962) followed by the San Francisco 49ers in 1963. Faloney remained in Hamilton, and teamed with Patterson to form one of the most deadly quarterback-receiver combinations in CFL history. The changes paid immediate dividends. Although the team finished third in the East, they defeated the Toronto Argonauts and the Hamilton Tiger-Cats in the playoffs. The 1970 season culminated when the Alouettes won the 58th Grey Cup, played on November 28 at Toronto's Exhibition Stadium before a crowd of 32,669. Led byquarterback Sonny Wade (who was named the game's most valuable player, and who would soon become a fan favourite in Montreal—not unlike the status his coach had enjoyed in the 1950s), halfback Moses Denson, receivers Gary Lefebvre and Tom Pullen, along with kicker George Springate, the team defeated the Calgary Stampeders 23–10 for the city's first Grey Cup since 1949, also against the Stamps. That 1970 victory would herald the beginning of arguably the greatest decade in franchise history. During Berger's tenure as owner, the team played for six Grey Cups and won three. They finally moved out of the Autostade and into Olympic Stadium midway through the 1976 season and attendance shot up. In 1977, the Als had a very successful year both on the field and at the box office, winning the Grey Cup at their home field before a Grey Cup-record 68,318 fans. They also averaged 59,595 fans per game at the "Big O" during the regular season, a league record that still stands. However, the success ended with Berger's retirement in 1981. He sold the team to Vancouver businessman Nelson Skalbania. The flamboyant Skalbania set about signing two first-round picks from the 1981 National Football League draft plus NFL name players such as Vince Ferragamo, James Scott, David Overstreet, Keith Gary and Billy "White Shoes" Johnson. Even with all that talent, the Alouettes suffered on the field, finishing with a dismal 3–13 record while attendance plummeted to under 20,000 per game. However, the East was so weak that year (Hamilton was the only team to finish with a winning record) that they actually made the playoffs, finishing third in the East ahead of the 2–14 Toronto Argonauts. In the East semi-final, they made a fairly good showing against the second-place Rough Riders before losing, 20–16. As it turned out, this would be the last game that the original Alouettes franchise would play. Skalbania was reported late in 1981 to be selling to oil magnate Pat Bowlen, who would later buy the NFL's Denver Broncos. Later in 1981, NFL coach George Allen obtained an option to purchase 51% of the club, and was actually named the Alouettes' president. While holding both the option and the post, Allen was surprised by Skalbania arranging a sale of the same controlling stake to Harry Ornest, who would later own the St. Louis Blues. Ornest, however, was reluctant to take actual control of the Alouettes as a result of the team's high level of debt and extensive commitments to high-profile stars. For a short time in early April 1982, Allen looked set to take control of the Alouettes. However, Allen left the club in late April after Skalbania was unable to resolve 1981 debts. With the franchise in utter collapse, Berger tried to force Skalbania to relinquish the team for him as payment for unresolved debt. Skalbania returned from a business trip to Hong Kong in late April and was able to fend off Berger's bid to regain control of the team. However, Skalbania's highly leveraged business interests collapsed only a month later. Unable to meet his obligations, he was forced to return the team to the league on May 13. On May 14, 1982, just a day after the original Alouettes franchise folded, Montreal businessman and Montreal Expos founder Charles Bronfman came to the rescue and founded a new team under the name Montreal Concordes. This team inherited the Alouettes franchise history and its players. The Concordes sported a 2–14 record in 1982 under head coach Joe Galat – the worst record in franchise history (just percentage points below the 1969 Als). The Concordes featured quarterback Luc Tousignant, the only Québécois quarterback to start a CFL game besides Gerry Dattilio. The dismal club also featured star collegiate running back David Overstreet who rushed for just 190 yards in six games before ending his season on the injured reserve list. The Concordes lost their last nine games of 1982. Other stars on the club included quarterback Johnny Evans, quarterback Turner Gill, slot back Nick Arakgi, running back Lester Brown, wide receiver Brian DeRoo, local kick returner Denis Ferdinand, defensive tackle Glen Weir, safety Preston Young, defensive end Gordon Judges, kicker-punter Don Sweet and linebacker William Hampton. The team gradually rebounded, even making the East final in 1985. 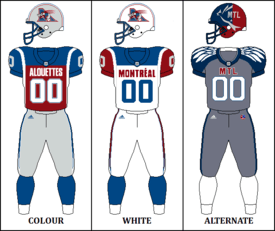 In 1986, the team attempted to embrace its predecessor's history and regenerate flagging fan interest by rebranding itself the "new" Montreal Alouettes. This would not prove to be successful, on or off the field. On the field, the team posted a dismal 4–14 record, this time missing the playoffs in spite of once again finishing third in the East on account of the new "cross-over rule" the CFL had implemented for the 1986 season. Off the field, financial losses continued to mount. The new Alouettes folded on June 24, 1987, just a day before the 1987 season started. So late did the Alouettes' demise come that the June 28 Washington Post still announced an ESPN broadcast of an Alouettes–Stampeders game, a game that would never be played. The team did play two preseason games before folding. The Baltimore Football Club was granted an expansion franchise for 1994 by the Canadian Football League. After the NFL's Indianapolis Colts (who had moved from Baltimore in 1983) blocked attempts to name the new team the Baltimore CFL Colts, owner Jim Speros eventually settled on Stallions as for a nickname. The Stallions were by far the most successful of the CFL's American teams, garnering persistent fan support in the Baltimore area and appearing in the Grey Cup in both its seasons (losing in 1994, winning in 1995). Only a week before the Stallions won the Grey Cup, Cleveland Browns owner Art Modell announced his intention to relocate his NFL club to Baltimore. Knowing that the Stallions could not even begin to compete with an NFL team, Speros decided to move the Stallions elsewhere. At one point, Speros was reported very close to moving the team to Houston, Texas. Although Houston at the time was still home to the NFL Oilers, fan support for that team had collapsed due their pending relocation to Nashville, so Speros had reason to believe a CFL team there could repeat the success that had been enjoyed in Baltimore. In addition, a team in Houston would have been natural rivals for the San Antonio Texans, who were still planning to play the 1996 season provided at least one other U.S. team also survived. On the other hand, the proposed move to Houston was considered in some circles to be little more a ploy to try and win concessions from the NFL, which presumably would not have wanted to risk the embarrassment of having one of its teams outdrawn by a team from another league in the same city. In the end, under prodding from league commissioner and former Alouettes running back Larry Smith, Speros began talks with Montreal. Smith had been looking for a way to return the CFL to Canada's second-largest market and, at the same time, find a way out of the failing American expansion. He believed that the defending Grey Cup champions would be a better vehicle for reviving football in Montreal than what would have effectively been an expansion team. At a league meeting on February 2, 1996; Speros formally requested permission to move the Stallions to Montreal. The request was granted, officially ending the CFL's American experiment. However, talks had been so far advanced that at least one Baltimore outlet reported that the Stallions were moving to Montreal in January. According to at least one Canadian outlet, at the same time Speros had already begun deciding whether to retain the Stallions moniker or "revive" the Alouettes. He ultimately chose the latter course, surrendering the Stallions franchise and reconstituting his organisation as the third incarnation of the Alouettes. While Speros was able to reclaim the history of the 1946–86 Alouettes/Concordes franchise, he was not allowed to retain the history of the Stallions. The Alouettes, however, do briefly mention the Stallions on their history page. To restate and clarify a rather confusing series of events: Bronfman returned the Alouettes franchise to the CFL just days before the start of the 1987 season. Soon after the Stallions won the Grey Cup in 1995, Speros returned the Stallions franchise to the CFL and reconstituted his organisation in Montreal. As part of the deal, Speros was allowed to reclaim the dormant Alouettes franchise, along with its history and records. As a result, the Alouettes are officially reckoned as having suspended operations from 1987 to 1995, while the Stallions' franchise is regarded as having been dissolved in 1995. While all of the Stallions players were released from their contracts, general manager Jim Popp, who followed the team from Baltimore, was able to re-sign many of them. However, as with of the other U.S. CFL teams the Stallions had been exempt from CFL rules that mandated a certain quota of Canadian "non-import" players on team rosters. For this reason, an expansion draft was held to help stock the Alouettes with the required number of non-import players. Popp hired former Stallions assistant coach Bob Price to be the new head coach of the Montreal Alouettes. As a result, the Alouettes were able to overcome a slow start to finish with their first winning record since 1979. They defeated the Hamilton Tiger-Cats in the East semifinal before being throttled by the Argos 43-7 in the East Final. In 1997, Speros sold the team to developer and investor Robert Wetenhall, who still owns the team today. Smith stepped down as league commissioner and became president of the Alouettes. Bob Price left the Alouettes to head south and coach in the NCAA. Popp hired former B.C. Lions head coach and Concordes defensive line coach Dave Ritchie as his successor. The team had a fast start, and eventually made it back to the East Final, where they lost to Doug Flutie's Argos on a last second touchdown pass by Flutie. The revived Alouettes franchise played their first two seasons at Olympic Stadium, but attendance in the cavernous domed stadium was very poor at first. The future of the franchise was very much in doubt until a twist of fate revitalized the floundering club. When a scheduled November 1997 U2 concert at Olympic Stadium conflicted with an unexpected home playoff game against the Lions (due to the CFL's 'cross-over' playoff format), the team decided to move the game to Molson Stadium, where they had played from 1954 to 1967. Interest in the team soared and the game was sold out, prompting the team to relocate permanently to the smaller venue beginning with the 1998 season. At the time of the Alouettes' return to Molson, the stadium's capacity was 20,202; an expansion completed prior to the 2010 season brought the current capacity to 25,012. Prior to every Sunday home game, the club plays "Sunday Bloody Sunday" over the PA system in tribute to the unintended role U2 played in saving the franchise. The team did not completely abandon Olympic Stadium – from 2001 to 2009 the Alouettes hosted one regular-season per year, as well as any home playoff games, at the much larger stadium. Since the expansion of Molson Stadium, the team now only uses the "Big O" for playoff games. The fortunes for the Alouettes started to the change during the 1998 season, when they acquired a young free agent quarterback from the Hamilton Tiger-Cats, Anthony Calvillo, and they drafted Ben Cahoon. Tracy Ham and Mike Pringle, led the team to second-place finish, and after a great season, they suffered a last-second loss to the Hamilton Tiger-Cats in the East Final. The Alouettes finally broke through in 1999, under new head coach Charlie Taaffe, winning their first division title since 1979. However, they lost a closely fought East final to the Tiger-Cats, 27–26. Tracy Ham retired after the 1999 season, and Anthony Calvillo took over as the full-time starter, he led the team to as they appeared in their first Grey Cup final since 1979, losing to BC, in a very contested game, as they came within a missed two point convert of sending the game into overtime. After the season Charlie Taaffe resigned to become the head coach of the Maryland Terrapins. The next season started under new coach Rod Rust at 9–2, but after Calvillo separated his shoulder, the team started struggling and after losing their all their remaining games, GM Jim Popp fired Rust, led them into the playoffs, where they lost to the Hamilton Tiger-Cats, ending a very disappointing season. During the off-season, the Alouettes signed Don Matthews, to lead the team in the future. They came all the way back in 2002, from a horrible past season finishing with the best record in the CFL and winning their first Grey Cup since 1977, by defeating one of their oldest rivals, and Matthews former team, the Edmonton Eskimos, 25–16. The Alouettes had the best record in the CFL during the 2004 season at 14–4 and looked liked a sure bet for a Grey Cup, but in the East Final, Anthony Calvillo got hurt, and was replaced by backup Ted White, and the Toronto Argonauts rallied to defeat the Alouettes, 26–18. During the off-season, all time CFL rusher Mike Pringle signed a one-day contract, so he could retire as a member of the Montreal Alouettes. The team participated in the first Grey Cup overtime game in almost 50 years. The Edmonton Eskimos defeated the Alouettes, 38–35. Jim Popp stayed on to coach the team during the 2007 season, and the team suffered its first losing season since coming back to Montreal in 1996, with an 8–10 record, aided by Anthony Calvillo leaving the team near the end of the season to be with his wife who was sick. The team lost the East Semi-Final, 22–20, to the Winnipeg Blue Bombers with backup quarterback Marcus Brady behind center. With Montreal hosting the 2008 Grey Cup, the Alouettes wanted to be there, so they hired an experienced NFL assistant in Marc Trestman, and helped lead them to an 11–7 record and a berth in the Grey Cup against the visiting Calgary Stampeders led by Henry Burris. The Stampeders defeated the hometown Montreal Alouettes, 22–14, in front of over 66 000 fans. The 2009 season was a record breaking season for the Montreal Alouettes, has they set a team record, and were a CFL best 15–3 during the season, and their defence was amazing, as they allowed only 324 points, second least in an 18-game season. Marc Trestman won the coach of the year, after leading them to a 28–27 comeback Grey Cup victory, thanks to the great play of Anthony Calvillo, Beh Cahoon, and Jamel Richardson. The Alouettes trailed the Saskatchewan Roughriders, 27–11, with 8 minutes to play in the game, when they started their comeback. It all came down to the foot of field goal kicker Damon Duval, who after missing a 43-yard field on the last play, got a second chance, when the Roughriders were called for having too many players on the field (The 13th Man), which was a ten-yard penalty, so kicking from the 33 yard line, Duval nailed it through the uprights, giving Montreal an improbable Grey Cup victory, after trailing the entire game. The game turned into a Grey Cup classic, thanks to great play of the Alouettes veterans, and broke a streak of 4 straight losses in Grey Cups. The 2010 season was another good season for Montreal, as they went 12–6 and became the first team since the 1997 Toronto Argonauts to repeat as Grey Cup Champions. They played against the Saskatchewan Roughriders for the second straight year, and won the game, 21–18, repeating as champs. The 2011 season was a record breaking year for Anthony Calvillo, as he broke numerous records, all against the Argonauts. During their first meeting Calvillo broke the CFL all time touchdown passes record of 394 TD passes on a pass to Eric Deslauriers, Damon Allen was at the game at Molson Stadium and personally congratulated him on breaking his record. He tied Allen's record in Regina the week before with the only touchdown pass ever caught by Tim Maypray. During the teams second meeting he broke the completions record with a completion to Brandon London. In the teams third meeting, Anthony Calvillo became pro footballs all-time leading passer, on a Jamel Richardson touchdown pass to end the third quarter. The play was stopped as his family joined him along with Mark Cohan for a special on field presentation and video tribute. NFL greats Warren Moon and Dan Marino, ESPN's Chris Berman, and Damon Allen each sent video messages congratulating him on breaking the record. Calvillo was presented with a special plaque, with the number 72382, the new pro football all-time yardage mark. The team lost an overtime thriller in the East Semi-Final at the Olympic Stadium 52–44 to the Hamilton Tiger-Cats. Anthony Calvillo announced his retirement on January 21, after a 20-year career, including the last 16 with the Alouettes. On February 24, 2014, the Alouettes named former Edmonton Eskimos and Calgary Stampeders coach Tom Higgins as the 21st head coach in franchise history. Higgins coached the Eskimos against the Alouettes in both the 90th and 91st Grey Cup games. The 2015 season was a difficult one for the Alouettes, as thanks to injuries to starting QB Johnathon Crompton, the Alouettes went through five different quarterbacks including two rookies Rakeem Cato, and Brandon Bridge, before trading for veteran Kevin Glenn. By that time the quarterback shuffle had taken it's toll on the team and they finished the year with a 6-12 record and missed the playoffs for the first time since 1986, their last year before folding on the eve of the 1987 season. In 2007, the Alouettes launched a new website that features exclusive news and information in a first for a CFL team. The Alouettes release all player announcements and other news on MontrealAlouettes.com at least an hour before releasing anything to the media. This has caused some controversy with news wires like CP, but remains a favourite with Alouettes fans. The site also features the exclusive player columns and features that make most top sports sites popular. Beginning in late 2008, the Alouettes became the first CFL team to exploit social networking sites such as Facebook and Twitter in their marketing campaigns, remaining the league leader in technology-based marketing. Since their return to the CFL in 1996, the Alouettes have appeared in the Grey Cup eight times, all between 2000 and 2010, with three Grey Cup wins. They most recently won back-to-back Grey Cup championships in 2009 and 2010, both against the Saskatchewan Roughriders, including a 'comeback classic' in 2009. The Alouettes have been to the Grey Cup more often than any other CFL team this decade and are considered by sports experts to be the most successful CFL team since 2000 in terms of regular-season statistics and Grey Cup appearances. 2010 onward saw a return of the blue, red, and white triangle "AM" (flying Alouette "M") logo and uniforms used from 1974 to 1981 as part of the CFL's throwback and retro uniform program. On May 22, 2015, Michael Sam signed a two-year contract with the Alouettes. The signing made him the first openly gay player in the CFL's history. Michael Sam left the team after dressing for one game. On August 21, 2015, owner Robert Wettenhall announced he has relieved Tom Higgins of his Head Coaching responsibilities and that General Manager Jim Popp will take over the duties of Head Coach at this time. On September 19, 2016, Popp was relieved of his coaching duties, while remaining GM. Jacques Chapdelaine was named Interim Head Coach, becoming the first Quebec-born head coach in Alouettes' history. Alouettes' main television coverage is fronted by TSN and French sister station RDS. Touché and Blitz are the mascots for the Montreal Alouettes. ↑ "GMC Teams Up With The Montreal Alouettes". GMC. 18 June 2013. Retrieved 11 November 2014. ↑ The Alouettes play their regular season home games at Percival Molson Memorial Stadium and home playoff games at Olympic Stadium. 1 2 "By the Numbers: Grey Cup Glory". Canadian Football League. 2 December 2010. Retrieved 11 November 2014. ↑ "Eric Cradock". CFLapedia. Retrieved 4 January 2014. ↑ "Ted Workman gives up co-ownership of Als". Ottawa Citizen. CP. 13 November 1967. Retrieved 11 August 2010. ↑ "Baltimore's Forgotten Champions: An Oral History". Capital News Service Maryland. Retrieved 11 November 2014. 1 2 Ralph, Dan (26 January 1996). "Speros reportedly close to pulling Stallions". Associated Press. Retrieved 11 November 2014. ↑ "CFL's American experiment ends as Stallions move north to Montreal". Associated Press. 3 February 1996. Retrieved 11 November 2014. ↑ "The CFL meets its destiny this week". Sports Business Daily. 31 January 1996. Retrieved 26 January 2014. ↑ "D-lineman Michael Sam signs with Alouettes". CFL.ca. May 22, 2015. Retrieved May 22, 2015. ↑ "TSN Radio 690 Becomes the New Home of the Alouettes with Multi-Year Broadcast Rights Agreements". Montreal Alouettes. 11 April 2014. Retrieved 11 November 2014. ↑ "Retired Jerseys". Montreal Alouettes. Retrieved 11 November 2014. ↑ "London Calling: Receiver delivers in Als win". The Canadian Press. Canadian Football League. 16 June 2011. Retrieved 11 November 2014. ↑ "Crompton leads Alouettes past Roughriders as Calvillo's number retired". TSN. The Canadian Press. 13 October 2014. Retrieved 13 October 2014.